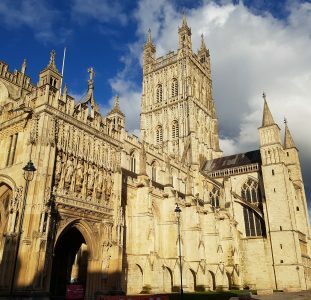 The cathedral was founded in 1050 when the seat of the Bishop of Devon and Cornwall was transferred from Crediton. A new building was begun in 1133 in the Norman style and was finished c.1150 which includes both the transept towers. The choir was begun in 1288 and the nave was replaced in 14th Century in the Decorated Gothic style. This cathedral has the longest uninterrupted vaulted ceiling in England.